Having conquered the lower end of the DAB radio market with its best-selling One radio, Pure has dished out another 50 quid radio. This time it's is trying to conquer the bedroom with its Siesta model - and it might just succeed. Pure, it seems, has woken up to the age of the eco warrior and constructed the Siesta mostly from recycled materials. Further Green credentials come courtesy of its standby mode: whereby, the unit consumes less than 1W. Although it's available in silver and charcoal, our sample is black - thanks to water-based lacquer, no less. Siesta's semicircular design isn't new for a bedside radio, but neither does it make much sense. Its low profile on a bedside table might be a boon, but the speaker is further away than it needs to be, something that precludes hearing it at low volumes. That same design characteristic keeps all the knobs away from easy use. It's a shame because there are plenty of features on the Siesta despite its overall basic character. A quick autotune function is slightly hampered by the Siesta's lack of a telescopic aerial and you may encounter some minor interference, especially if you move the unit around. There's also an FM tuner, complete with RDS (radio data system) for automatic tuning and station names, but the most impressive feature, for us, is the DAB tuner's Intellitext and Textscan features. Both combine to allow the user not just to inspect different genres of scrolling text - business headlines, sport, entertainment or politics - on a radio station, but it's also possible to scan through them more quickly. It's great if you want to catch up on the headlines seconds after waking up without having to figure out what Today's John Humphrys is talking about mid-interview. You can even save them to read later, though we can't imagine why you would. Connectivity is scant and restricted to a simple headphone jack hidden at the back of the speaker. We would like to have seen a line in for connecting an iPod or similar, but unfortunately the sound quality is such that speech radio is all you should be aiming for with the Siesta. The positioning of the speaker might cause a few problems if you're planning to listen quietly, but at least volume buttons can be turned really low, although the sleep timer doesn't fade out the sound slowly, as is possible on some Pure radios. Instead, a loud pop accompanies the Siesta's slide into unconsciousness. It's likely to wake you up. At least three alarms can be set for weekdays, single days or even separately for weekends. These three alarms are important, given the Siesta's bedside nature. They're also why we partially forgive its weedy sound: bereft of bass and too high on treble, the Siesta's treatment of music is rather woeful from its mono speaker, although speech radio is acceptable. 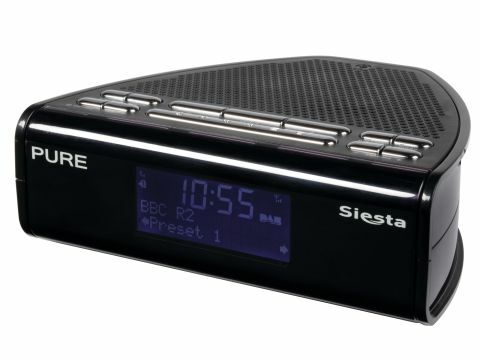 Despite poor sound and its plastic feel, the Siesta remains a user friendly DAB radio with some pretty unusual features.